The town of Hastings on the south coast of Britain is not, today, the kind of place you would go looking for bold architecture or trail-blazing transport innovation. It is frequently overlooked in favour of its near neighbours Brighton (bigger, brasher, bolder) and Dover (giant ferry port with links to France). Its modern railway station is competent but unexciting. It’s a recent replacement for a smashing James Robb Scott Southern Railway building, built right on the cusp between the company’s neo-Georgian phase and its later Art Deco leanings (and therefore much like Scott’s dock gates at Southampton). Its most notable feature was a huge octagonal ticket hall lit by an enormous lunette and octagonal skylight. Unfortunately the Scott building was scandalously neglected and got itself demolished in the early 2000s rather than repaired, after the rot set in so badly that it became economically unsalvageable. At this point, I should declare an interest. I grew up in Hastings, and I used the old station. A lot. The loss of it rankles still. Nevertheless, there are some things in which a transport-minded resident of Hastings can still take pride. For in its time, Hastings led the country when it came to transport. 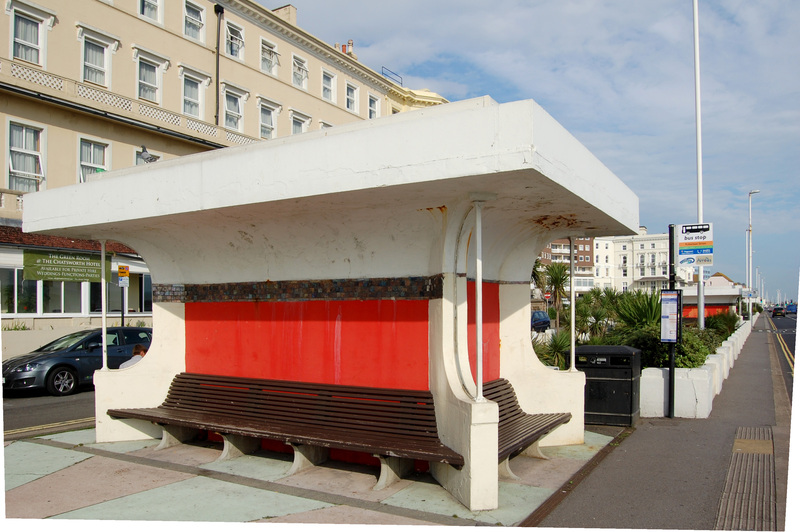 Regular readers of this blog will recall that the last time we visited Hastings it was to take a look at a Streamline Moderne bus shelter on the sea front, which might or might not have earlier served the town’s tram and trolleybus networks. Listed at Grade II by statutory heritage body English Heritage, it is one of a group of similar shelters (more photos of them here) that were constructed as part of an Art Deco remodelling of almost the whole sea front by borough engineer Sidney Herbert Little in the 1920s and 1930s. They were later complemented by a huge Streamline Moderne apartment block on the seafront called Marine Court (see some photos of it here) completed in 1938; it just about merits a mention in this blog on the grounds that it was designed to look like an ocean liner. All these glories are now distinctly faded. Though their original style shines through, up close the neglect is obvious. Some towns go to town to celebrate their Art Deco heritage. Hastings doesn’t seem to realise it’s got one. But back to the story. The other element of Little’s scheme was the construction of something the likes of which Britain had never before seen. And that something was…an underground car park. Extraordinary as it is to think of today, given their ubiquity, the very first underground car park in Britain was built in an otherwise unremarkable seaside town, whose previous greatest claim to fame was as the location of the battle that secured the Norman invasion of England in 1066. And it’s not even the actual location of the battlefield. The opening of the new car park was an event so exciting that postcards featuring it were issued. 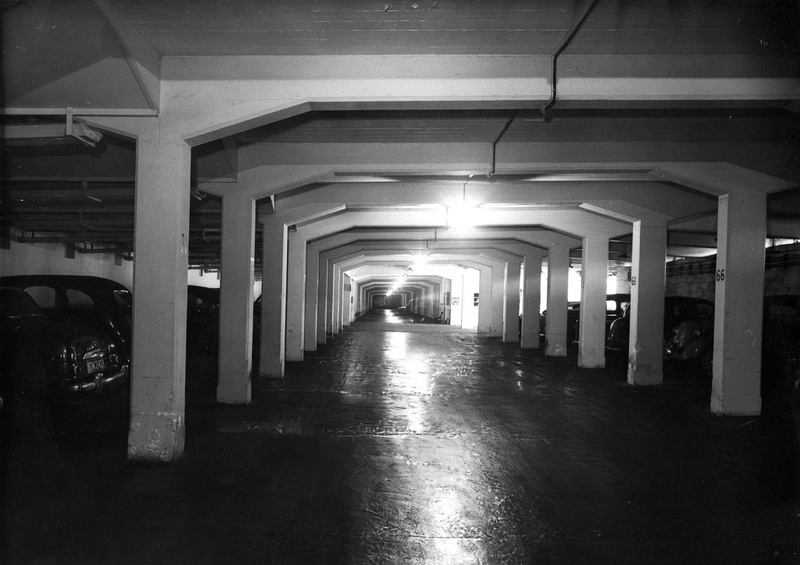 Opening in 1931, Carlisle Parade underground car park was a new way of providing parking space for an already increasingly popular mode of transport, without sterilising blocks of urban space. 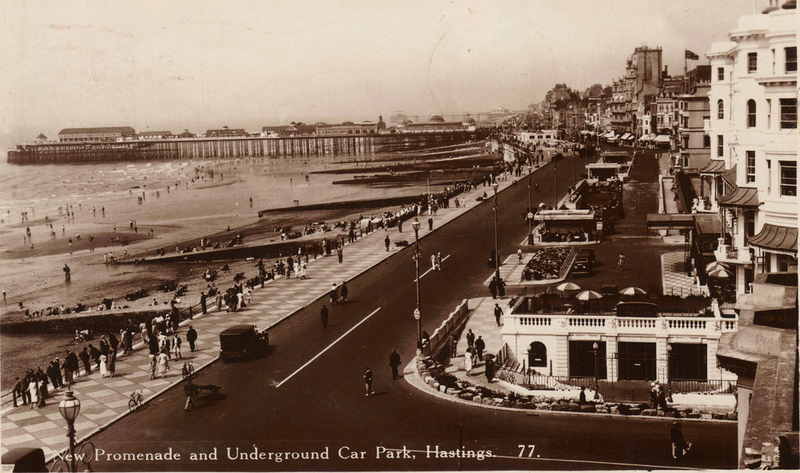 In the case of Hastings, Little was also concerned to ensure that views of the sea could be obtained without parked cars blocking the view. It’s a lesson the local authority singularly failed to heed in later years, with a great big beachside car park built slightly further east proving an absolute eyesore to this very day, not to mention the on-street parking along the seafront. Best of all, if your car park is under the ground, you can also put something else on the top of it and get double the use from your plot of land. In the case of Carlisle Parade car park, above it is a sunken garden and (fittingly) a road: Carlisle Parade itself. Definitely the first in Britain, Carlisle Parade underground car park wasn’t the world’s first, despite occasional rather over-excited claims to the contrary (for instance here). Nice try, but Pittsburgh (Pennsylvania, USA) had one in the 1920s, and that’s been claimed as the world’s first. Two ramps lead down to Carlisle Parade car park’s entrance (a third ramp is now out of use), and cars are prevented from accidentally driving down off Carlisle Parade and into the voids by a decorative parapet wall and balustrade, of fluted concrete panels. It’s a simple solution into which Little put the care and attention singularly lacking in many later underground car parks. Inside, the car park itself is long and narrow with bays on either side of an access road. The bays are separated by portal frames which support the concrete roof above. Today, more advanced building techniques mean that fewer supports would be needed to achieve the same effect. The multitudinous portal frames of the Carlisle Parade car park delineate the space inside quite beautifully, but they’re a nightmare to navigate in today’s large cars, which are much wider than their smaller counterparts of the 1930s. But with an underground car park comes an obvious problem: ventilation. It was even more pressing in the 1930s. Car engines were less efficient, particulate emissions were much higher and there were no such things as catalytic converters. The simple solution was a series of three ventilation shafts, but design-wise Little provided one of the best solutions to an urban ventilation shaft anywhere in Britain. You’d never know what it was, unless you already did. The rectangular shafts feature splayed curved roofs, with corner wing walls. Fitted benches rest on curvy concrete legs. 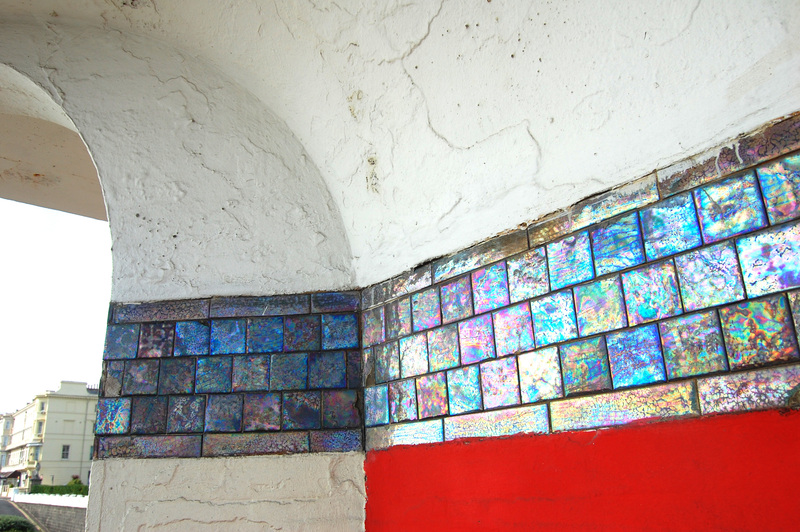 Pearlescent tiles shimmer above the heads of shelter users. It’s not clear whether the tiles, or indeed the red paintwork, are the original decorative schemes, but they certainly work well. 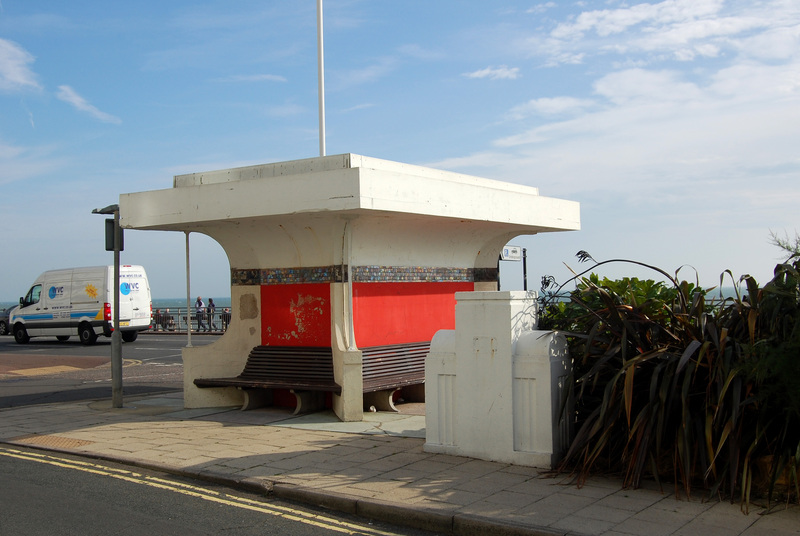 Like Hastings’ other seafront Art Deco features, they’re not tended to with the greatest of care. The rendering is cracked and the paintwork peeling. Super-stylish dome lights on the underside of the roofs (see here) have disappeared. Originally there were glass panels in the corner walls, long since gone. Some of the roof corners are damaged, and empty cans of super strength lager suggest that the benches are being used for the purposes of cheap inebriation, rather than quiet contemplation of the sea. True to form as a popular public location for the consumption of cheap alcohol, one of the ventilation shafts is also in use today as a bus shelter. It thus doubles up on its qualifications for an entry here. 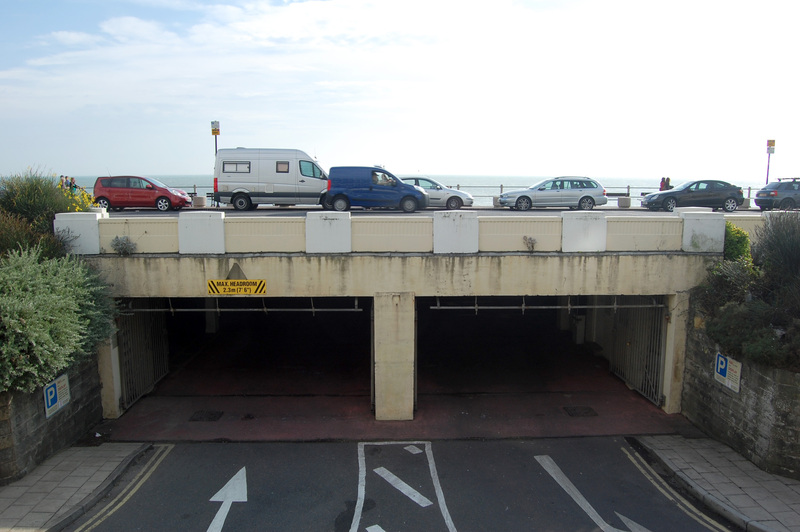 As Little’s scheme progressed along the sea front, he built further underground car parks below the promenade. Another shelter, opposite Hastings’ White Rock Theatre, also disguises ventilation shafts aerating the Pier car park below. It’s not quite of the same drama as the three above Carlisle Parade car park, although it is also Grade II listed by English Heritage. It’s in use as a bus shelter today, as well. As a collection of Art Deco architecture, the car parks, shelters and promenade are well worth a visit. They’re also well worth keeping in better condition, but I suppose Hastings Borough Council might have trouble convincing its local taxpayers that historically important transport architecture is as worthy a recipient of their council tax contributions as, say, local refuse collections. The council certainly doesn’t trade on the national significance of Carlisle Parade car park. Its website waffles on about the Secure Car Park accreditation Carlisle Parade underground car park has achieved for the past seven years, but says nothing about its place in history as Britain’s first, nor its architecture. 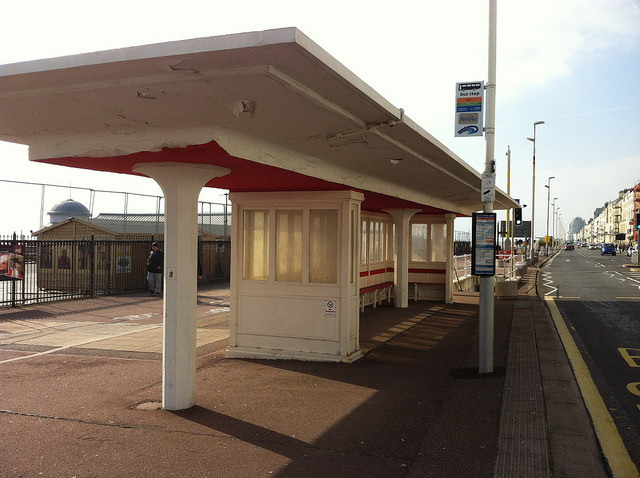 Some of Little’s seafront shelters, here. The Carlisle Parade car park ventilation shafts, here. National Heritage List for England citation for Little’s Hastings seafront works, car park included, here.